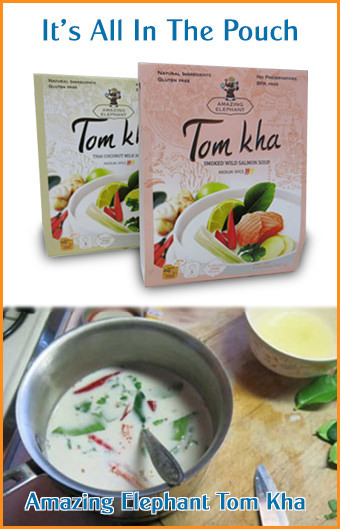 In a mortar and pestle, pound together lemongrass, kaffir lime leaves, and galangal until fine. In a large mixing bowl, add pork and the rest of the ingredients, mix well. Mix by hand a glove. Do not knead, make sure the pork fat stays in shape. Tie one end of the pork casing with string then use a funnel (see pictures and video below) to force the mixture into the casing. Prevent air bubbles from forming, and do not over-stuff it. Tie the other end. 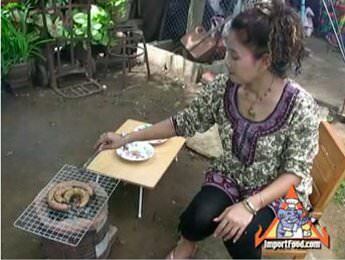 Now your sausage is ready to cook. For best results, use a bamboo skewer to poke holes in the casing. Poke it before and during the cooking process, this will make sure that the sausage doesn't break while cooking. Grill on low heat, keeping watch. 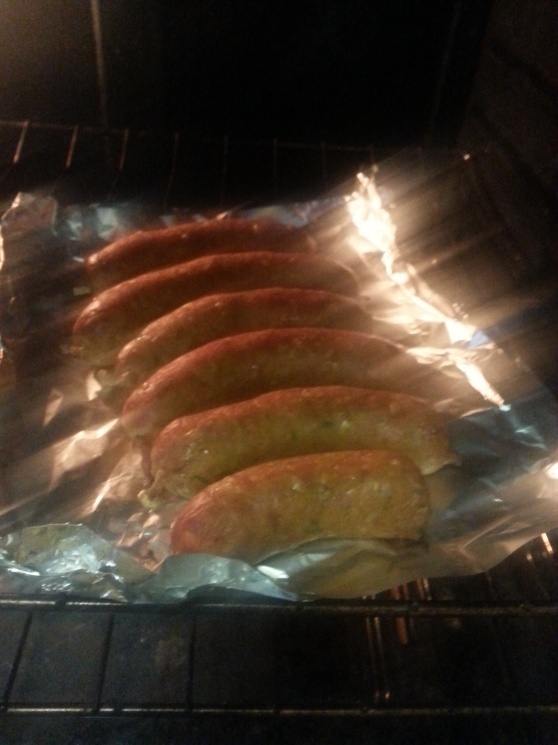 Flip and poke until golden brown, dry and aromatic (about 25 to 30 minutes (depending on the size of the sausage). My name is Ed Thompson. 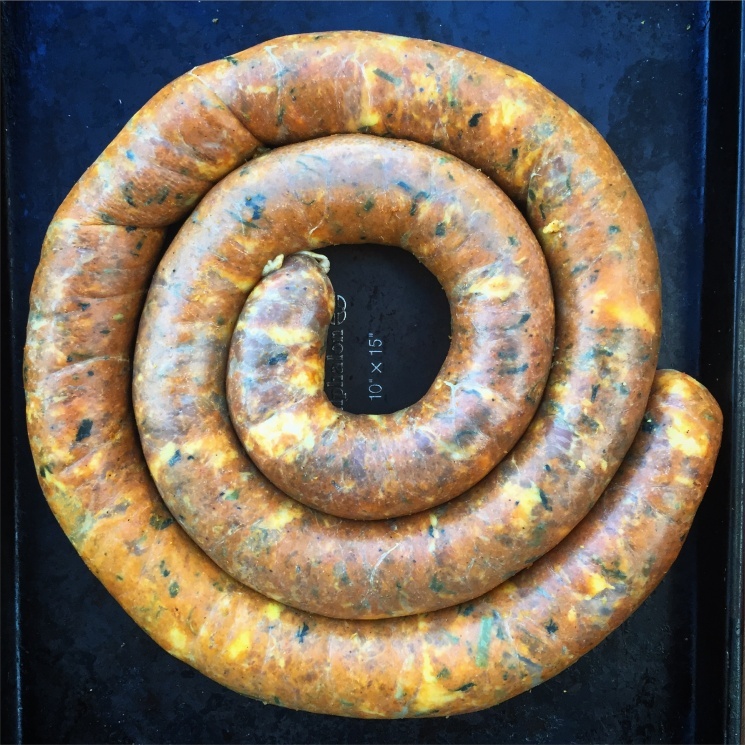 I recently used your recipe for Sai Oua and made 20 lbs of this wonderful sausage. 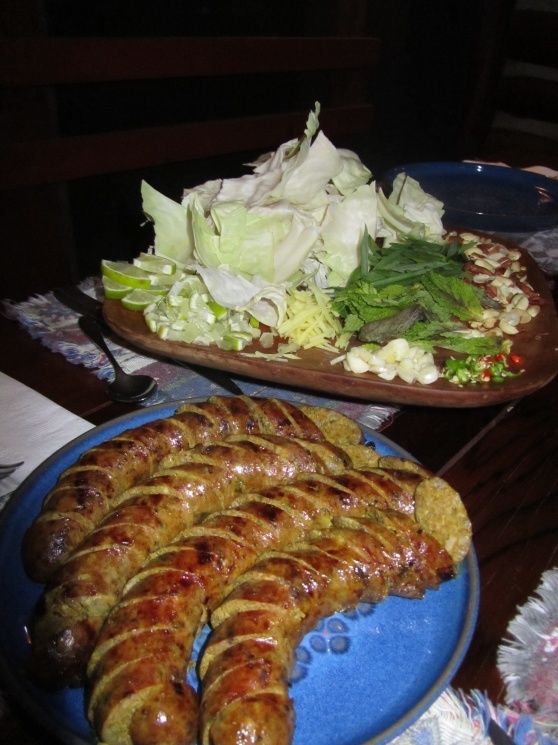 The taste is wonderful and it reminds me of the Northern Thai sausage that I enjoy so much when I am in Thailand. 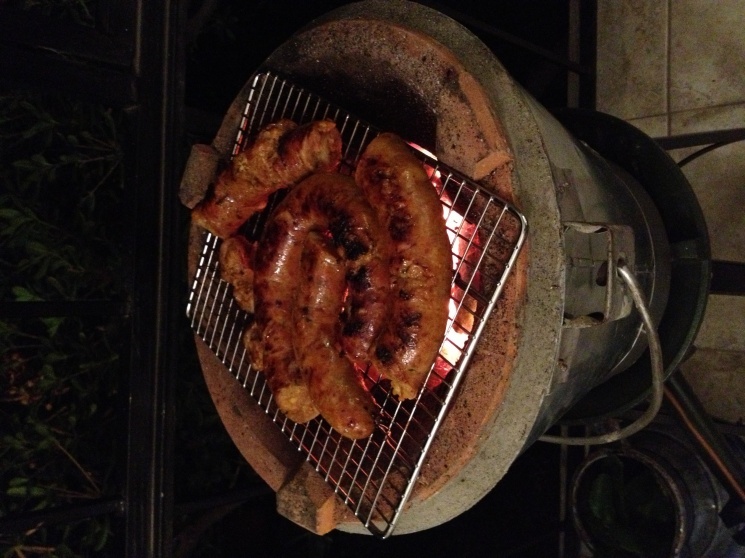 Many of my friends have tasted and enjoyed my sausage as well. Thank you for the great recipe. Many of my friends have tasted and enjoyed my sausage! I like thar ED. I just made that sausage for tomorrow. I tasted a little and it is fantastic ! I did it with 1.2kg of pork, a nice fatty cut, and no added pork fat. 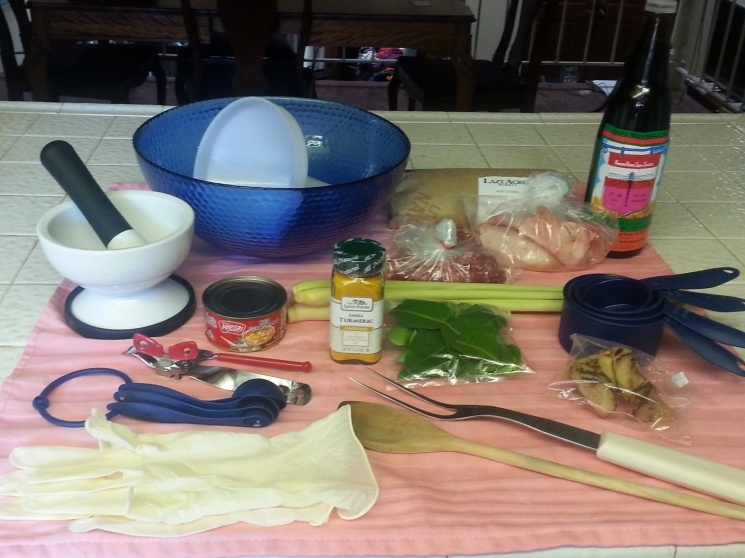 I tripled the quantities of the other ingredients, except for the lemongrass. I used a little less lemongrass than suggested, and bought it frozen from my local Chinese supermarket. I grated it and finely chopped it afterwards. I found the kaffir lime leaves frozen too, at the same supermarket. Excellent. A very surprisingly authentic Thai taste, that takes you right back there after the first bite ! Thanks for sharing, i love it ! The recipe for Sai Oua how much will it yield how much sausage casing is required. I made the sai oua and I found it lacking in flavor not the same as I got from the street venders in my soi in Bangkok It tasted same but not as flavorful. Can i use chicken or beef instead of pork. I do not have access to sausage casing. 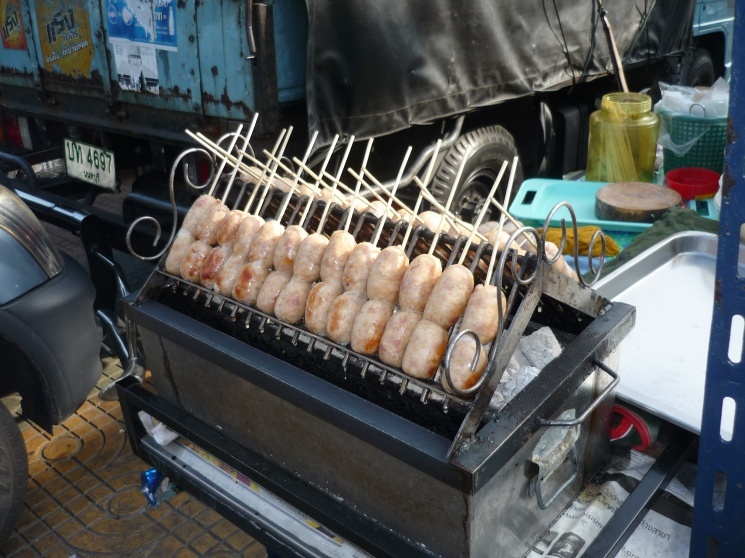 Can I make "meatballs" with the sausage, skewer them on bamboo skewers, grill them and serve as an appetizer? Also want to try this with Sai Grok. The street vendors sausages in chiang mai that i have tasted the last 10 years have cooked sticky rice in the mixture,trully a mouth watering meal along with cabbage &chilli . Made it last night! I fried some for breakfast with Thai fried egg salad and it was wonderful.